This is a continuation of a travel series to Savannah, Georgia. If you'd like to start at the beginning, go HERE. The rest of the posts in consecutive order are HERE, HERE, and HERE.. When I was planning our trip to Savannah, everyone kept telling me about all the amazing restaurants in the city. I kept a list of these restaurants and I did find some of them and ate at two of them, but most of the time we really struggled with finding a good place to eat. One of the reasons was that a lot of the recommendations were for hoity-toity places we weren't interested in. One of my favorite quotes from the late great Anthony Bourdain was "I feel like an orangutan stuffed into a tuxedo in places like this". He was referring to a fancy, formal, upscale restaurant. My husband and I feel the exact same way. We just can't enjoy ourselves and we really have issues spending that amount of money on food. Another reason we found finding a place to eat difficult was that we were always in the wrong place at the wrong time! Often there was not a restaurant nearby where we currently were when we were hungry or it was only open for breakfast/lunch and closed for dinner and vise versa. We just had a lot of bad luck! Well one place mentioned on our trolley tour and that my husband read about in a travel brochure was The Pirates House. He thought it sounded like a lot of fun so we went there. The Pirates House has a long history in Savannah. It sits on the original site of General Oglethorpe's Trustee's Garden established in 1773. An Herb House was erected in 1734 to house the gardener. It is still there and is actually a part of the restaurant. It is considered the oldest house in Savannah. We were there after the lunch crowd, late in the afternoon before the dinner crowd, so we almost had the whole place to ourselves. It was really nice for taking photographs! When you first enter, you are greeted by a hostess in period Pirate costume! The Old Pirate House was first opened in 1753, long after the garden was gone. It served as an inn for seafarers and eventually became a hot spot for pirates and sailors! A lot of folklore surrounds this place. It is said that men were kidnapped here to be used as workers on ships. They were kidnapped by using a tunnel from the old rum cellar that led to the river. The most famous story involves a Savannah policeman. Legend has it he stopped for a drink and awoke on a ship sailing to China. It took him two years to make his way back to Savannah. The Pirates House is a great place to stop and eat because you get to tour a famous architectural spot in Savannah and learn more about it's history without paying an admission fee...just the cost of food! 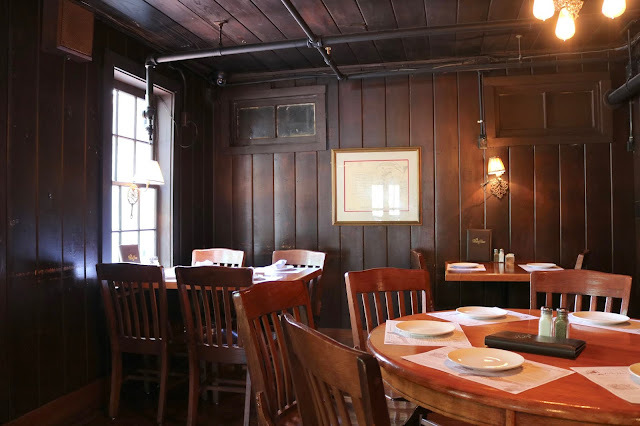 The building has been carefully preserved through the years. 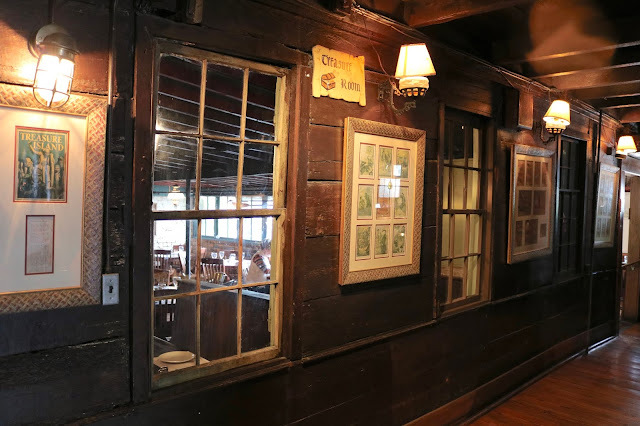 In the Captain's Room, the ceilings are hand hewn logs joined with wooden pegs. 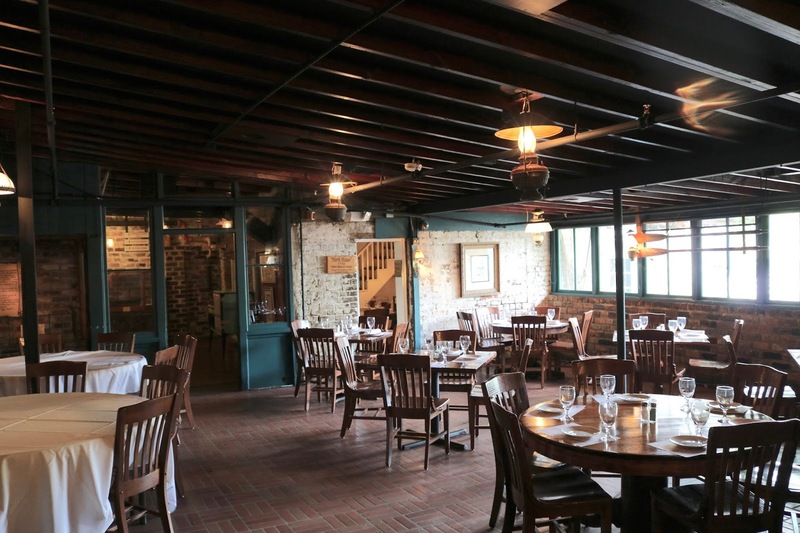 The Herb House still has the original brick walls and heart pine floors. The restaurant is a complex mix of buildings all connected to each other. You are free to walk around and read all the history and take pictures. 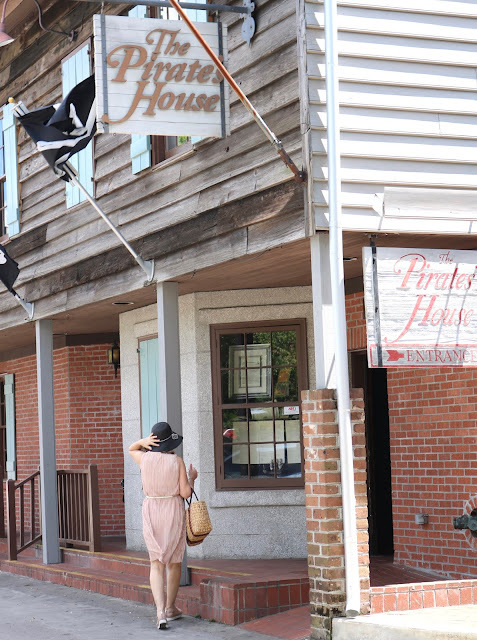 The employees also are very knowledgeable and can answer any questions you have about the Pirates House history. I really liked the Herb House. I loved that people could eat inside here! It was like they had their own private room. So much of the original house remains intact. The only difference, is that there are tables and chairs set up for restaurant guests. The second floor however was closed to the public. Well, by now your probably wondering about the food. We didn't like it, haha! But, please, don't let that discourage you from going because we loved our experience there. We think we just ordered the wrong items. That happens sometimes when you try a restaurant you're not familiar with. My husband ordered Chicken Tenders with Fries. I had a salad which was recommended to me by the waitress. I didn't like it because it was SO SWEET! I felt like I was eating a bowl of sugar. The dressing was sweet, then it had tangerines in it, even the nuts were covered in a sugary coating. If there is anything I've learned about the south is that they love sugar. Here in the north, we just don't eat or drink everything with so much sugar in it. I wonder if it has anything to do with where sugar cane grows? If you believe in ghosts or are interested in ghost stories, the Old Pirate House is considered one of the most haunted places in Savannah. One ghost story involves The Herb House. When a customer mentioned to his server that he did not believe in ghosts, his pie left his plate all on it's own, traveled across the room and smashed against the wall. People also have seen cloudy images in their pictures taken at the Pirate House. Now did we see any ghosts or feel any strange presence when we there? Nope. But, we are not believers in that stuff. We believe there are angels and demons. When someone dies, they go to heaven or hell. There is no such thing as ghosts and we saw nor felt anything out of the ordinary. What a cute little place! I love historic buildings, but this one being haunted, I don't know if I could go, haha! Oh no worries, like I said, we didn't see or feel anything out of the usual. I am a huge fan of Savannah! I remember seeing the Pirate's House. Need to check it out next time. Looks so fun! Yes, you must check it out. It's a fun place and very interesting. It's a shame you didn't enjoy the food so much, as it looks like a really fun and interesting place to eat! I've never had a sweet salad like that either so that would be a first for me! Oh, that's ok. I think we just ordered the wrong thing. It's always hard knowing what to order when you try a new place. Sorry your not feeling well. It does look like a fun place, Amy. But we always say that if you didn't like the food, you should give it a second chance. Food taste is just as subjective as clothing taste..ha ha!! We always love the locally owned places when we go traveling...maybe the food isn't always our fave, but the ambiance is!! Yes, I totally agree! Ambiance is everything and the place deserves a second chance. It's so tough not to know what to order and then being a little underwhelmed with your meal- but the atmosphere! What a cool place to visit. Yes, so true. Especially when your in a different part of the country where the food is so different from what you're used to. The food looks delicious! I love the blue shutters on the building. I always seem to have trouble finding good places to eat if I don't plan a little ahead on our trips. I do like to maybe go to one nice place while we're on vacation, but definitely not for every meal. It'd add up quick! Plus, sometimes little hole in the wall places are the best kind! Yes, absolutely! Sometimes the food can be the most expensive part of the vacation if you're not careful. 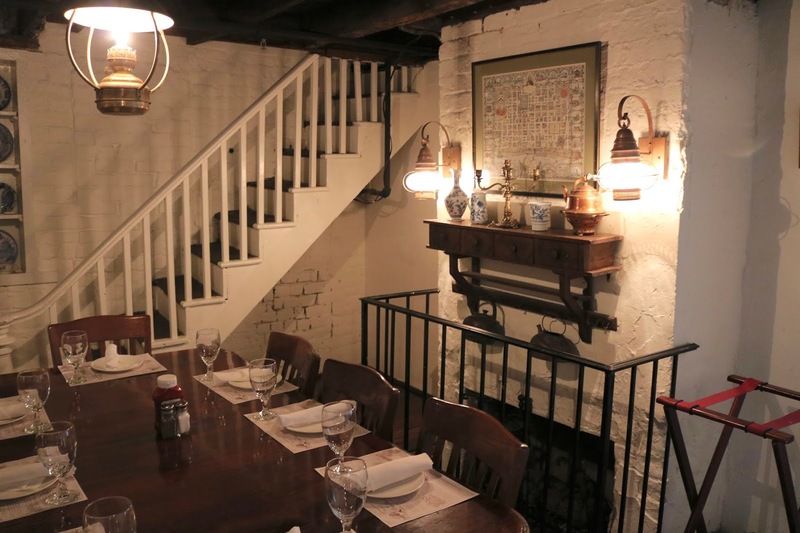 Looks like a fun restaurant to visit with so much history! The salad actually looks delicious, but too much sweetness can ruin the taste. Yes, it's filled with history! What a great place to have some food at, Amy! Nice photos as usual! Thank you for taking part in the Travel Tuesday meme!